Do me a favor: go by Sar's and look for me in her sidebar. You will see that my blog provided the Word Play Wednesday Inspiration of the week. And, if you go to Megan's blog, you can see the painting I named (a contest was held). The prize was a print (copy) of the painting. I'm afraid the original has already sold, but look around the site. Megan has many bold, glorious originals awaiting adoption. I signed on to the "write a-post-a-day in November, no matter what" movement. I figured, how hard could it be? I usually one post per day anyway. Well, the thing is, it is report card time and I am up to my ears in ungraded papers -- probably caused by all that time I spend here with you. On top of that, the first day of November was Wordless Wednesday and I couldn't introduce this seal and tell anyone what I was doing without talking .... Still, I did post yesterday, even if I wasn't flying the seal. So, I hope the NaBloPoMo (National Blog Posting Month) Police are okay with that. They didn't say what kind of post or how long it had to be. AND I look forward to seeing what you produce! I say, bring it on! I love it when the rules are vague because it allows one to use her imagination and you have a great one! A post a day??? Yikes. I cut back because it was too much. Quilly-Sister, went to Megan's and saw her great paintings - how cool that you are getting that one. And you won't have trouble with a post a day, girl, you do it anyway! I thought you did a post a day already. I'm sure you'll do it. busy girl as usual, how great to see..i hope you win them all hon..thanks for the lovely sentiments. i'm on my way back, so get ready to have me invade your space soon, lol, i hope..
take care until and know i miss your post terribly. 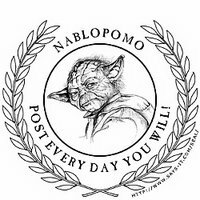 will not only do a post a day....you will do a great post a day! A post a day for you no problem. Hey Quilly, you and I are competing for the Caption contest over at Sar's. The finalists are in. You're a much better promoter than me though-- besides being an ace with words. I wish you'd compete in my challenge. You can hear crickets at my post. I guess I need to get out and promote better there, as well. I love the look of your blog. So pretty. In fact I'd vote it the prettiest I've seen. I'll be back to read some more when this month's up.